Working Virtually: Transforming the Mobile Workplace, 2nd Ed. Is On Bookstore Shelves Today – Digital and Print! Working Virtually is a permanent part of the workplace today. Transactional work – provided by freelancers, contract employees or consultants – has increased exponentially. It is forecast that as much as half the labor force will be working independently and virtually by 2020. Trina first sees her book in print. Most organizations and leaders are still grappling with how to effectively manage their virtual staff and how to effectively support and motivate them. This is an increasingly urgent task as more Millennials join the workforce with changed attitudes toward work satisfaction and organization commitment. 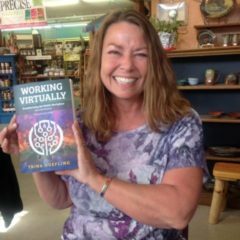 Working Virtually is the fruit of the author’s three decades of experience planning and implementing remote work initiatives and training virtual team leaders. It’s the perfect primer for executives, support functions, team leaders and virtual professionals. It provides expert guidance for anyone planning a shift to mobile work. Whether you manage teams of teleworkers or are yourself a virtual team member, you are a leader with shared responsibility for virtual teams that produce successful outcomes. Previous: Previous post: IBM is Seeking the X-Factor. Does Team Synergy Have to Be F2F?